Senate GOP leaders, including Sens. Linsey Graham, center, and Bill Cassidy, third from the right, face an uphill battle to lock in enough votes to repeal and replace the ACA. The shape of a large part of the U.S. healthcare system may be determined by a single GOP senator this week. Nearly all healthcare stakeholder groups and some governors, including from red states, are pressing Republican senators to oppose the Graham-Cassidy bill to repeal and replace the Affordable Care Act. They warn the bill, unveiled on Sept. 13, would leave tens of millions more Americans uninsured and gut protections for people with pre-existing medical conditions. On the other side, Senate GOP leaders, the Trump administration and conservative activists—still fuming over the narrow failure of their previous repeal try in July—are telling them this is the party's last chance to dismantle Obamacare, and that the policy details are less important than fulfilling their long-standing promise. Senate Majority Leader Mitch McConnell wants to take up the bill this week, before authorization to pass it under budget reconciliation rules requiring only 51 votes expires on Sept. 30. Republican leaders are scrambling to win over wavering senators for their last-ditch effort to dismantle the Affordable Care Act, as lawmakers fret over the Graham-Cassidy bill's projected funding cuts to their states. Arizona's John McCain and Kentucky's Rand Paul, said they will vote no. McConnell can't afford another defection since no Democrats support the bill. At deadline, McConnell's office did not respond for comment to confirm that a vote is still on track, nor did officials from the office of Sen. Bill Cassidy, one of the bill's co-authors. As of Friday, Kansas' Jerry Moran, Ohio's Rob Portman, and West Virginia's Shelley Moore Capito had not indicated how they will vote. Nor had Alaska's Lisa Murkowski, who helped dash the last attempt at repeal. Maine's Susan Collins is a likely no vote. "I believe we could do better working together, Republicans and Democrats," McCain said Friday. "Nor could I support it without knowing how much it will cost, how it will effect insurance premiums and how many people will be helped or hurt by it." The Congressional Budget Office said it could only issue limited estimates on how the bill would affect deficits in time for a vote this week, not on coverage or premiums. "We've seen this movie before, and sequels haven't been doing that well at the box office lately," said Tom Miller, a conservative health policy analyst at the American Enterprise Institute. Many senators are nervous about the bill's big projected cuts in funding to their states. It would convert the ACA's funding for premium and cost-sharing subsidies into $1.2 trillion in state block grants through 2026 and let them design their own systems, with few limitations on how they could use the money. There is no provision for funding the block grants after 2026. States that expanded Medicaid and saw large enrollment in ACA marketplace plans would suffer the biggest losses. Many of those states are represented by GOP senators whose votes are pivotal to passing the bill. Under the bill, states could let insurers offer plans with fewer benefits than the ACA requires, such as coverage for maternity care, behavioral health and prescription drugs. They also could let insurers charge higher premiums for people with pre-existing conditions. 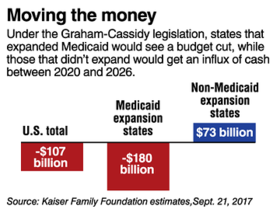 States would have to end their Medicaid expansion programs for low-income adults in 2020. Starting that year, federal payments for the traditional Medicaid program would be capped and cut, with per-capita payments growing more slowly than the rate of medical inflation after 2024. The Center for Budget and Policy Priorities estimated that Medicaid spending would fall by $175 billion between 2020 and 2026, and by far more in later years. The ACA's individual and employer mandates would be abolished immediately, which critics say would quickly disrupt the market by prompting younger, healthier people to drop coverage. The ACA's taxes would be preserved with the exception of the 2.3% levy on medical-device sales. Every state would have to design and implement a system for its individual insurance market and Medicaid program by 2020. That prompted the National Association of Medicaid Directors to warn that most states would not be able to get a block-grant system up and running in the bill's two-year time frame. The Senate parliamentarian still has to rule on whether the bill's provisions comply with complex budget reconciliation rules. If the insurance waivers are stripped out because they are deemed outside the scope of budget reconciliation, all the bill would offer states is a lot less federal funding. Alaska, for instance, would get 69% less in federal funds by 2026 than it would receive for premium subsidies and Medicaid expansion under current law, according to a report by Manatt Health commissioned by the Alaska Department of Health and Social Services. "We believe (the bill) would have damaging consequences for Alaska," said Becky Hultberg, CEO of the Alaska State Hospital and Nursing Home Association, which is pressing Murkowski to vote no. "And developing a new healthcare plan is a heavy lift in a small state with limited administrative capacity." The renewed push for an ACA repeal derailed a bipartisan Senate effort to stabilize the individual insurance market, including funding payments to insurers for the law's cost-sharing reductions to low-income enrollees. That means insurers will not know whether they will continue receiving these payments by the Sept. 27 deadline for them to file 2018 plans and rates. "So it's chaos," said John Baackes, CEO of the L.A. Care Health Plan, which serves 2 million Medicaid and exchange plan members in California. Action on renewing funding for the Children's Health Insurance Program and for federally qualified community health centers, which runs out Sept. 30, has also been delayed.